German-born pianist/composer Henning Pertiet has made a career out of keeping alive the tradition of boogie-woogie. Marked by frenetic counterpoint and rhythmic propulsion over buoyant bass lines, the blues-based style was the intermittent backbone of jazz and rock & roll throughout the middle of the 20th Century, with everyone from Fats Domino and Oscar Peterson to Jerry Lee Lewis lending credence to the form. 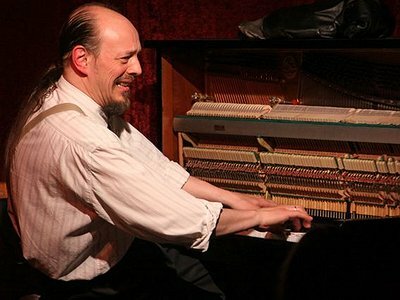 A relative late-comer, Pertiet has managed to illustrate its longevity, enjoying a nearly three-decade career performing boogie-woogie both as a solo pianist and as an ensemble player with the Vienna-based Mojo Blues Band. He has also set up an outlet for his electronic experiments, called Teitreph, on which his style, channeled through effects and propelled by stuttering beats, is warped into another dimension. While Teitreph relentlessly pushes the envelope, his latest album, a solo effort titled Masterpieces, Vol. 1, features music by Thelonius Monk, Duke Ellington, and Pertiet himself, among others. I started playing piano maybe at the age of 6, 7 or 8 – I cannot remember exactly. Even earlier I started playing flute (Blockfloete) as probably thousands of Germans did. Having turned 13, I 'needed' to learn guitar; rock, folk and hippie music as they were calling it. But all these efforts were not very effective. There was nobody there to really show me what I could do with such an instrument. It was no fun. It was a horrible time for me. After having heard Boogie Woogie piano at the age of 23 I picked up the piano again and became a professional very soon. This music seemed to offer more freedom than the classical music preferred by piano teachers, which I'd had to learn earlier. And after being a pro for more than 15 years I became bored more and more and began searching for something more... hmmm...that would satisfy me more. I love playing Blues & Boogie; I still enjoy almost every single concert. I finally found it in Keith Jarrett's solo playing, Cecil Taylor and John Coltrane's recordings made shortly before his death. These where really free. Digging deeper and deeper into music in general I also came across Indian classical music and bought a sitar and a lot of recordings of Indian classical music. I deeply fell in love with their music concepts even if I didn't really understand it. I started playing bass, electric and double-bass at the age of 41 and some other instruments like the accordion and synthesizers and so on I think I was maybe 43. Years ago when a good friend introduced me to Keith Jarrett's Köln Concert for the first time, I didn't like it all. I was so busy with my blues and boogie stuff that maybe there was no space in my head. It took many years to become open-minded. The most important moment for free improvisation, would be the time in my life where I needed to go to psychotherapy. This lasted many years – altogether I'd say ten years. During this time I think I became more free within my feelings and more self-confident so that I could open my mind for other music than blues. I have always loved free things. Maybe I should not say 'I love it' but in fact I can't do it any other way. The first thing I ever played on the piano in our home in Hamburg was something I called 'Blitz und Donner' (thunder and lightning). I must have been pretty young – like maybe 5 or 6. I used the piano just for making certain sounds; like the bass I used for making thunder as one can imagine. Just play enough keys altogether at one time and loud enough and it can sound like thunder. But you must use the sustain-pedal – a lot. Using the higher register of the keyboard you can easily make some lightning by striking the keys not rhythmically. Just look at a lightning and see the form it has and try to put the form on the keys. I still think about that years later, I remembered that I used to play this at home. But back then it was like a game and nobody would have told me that this is music, that it wasn't only a game, that this already was art. It was just a kid fooling around. Later I found this was something valuable, something worth remembering and recording. I think this must have been during a time when I fought one of the biggest fights with myself – during the time of psychotherapy. When I left my son and his mother to go back to Germany it didn't take long until my life didn't work any more. I got panic and fear all day and couldn't do anything anymore. So I needed to change my life and I did. This also meant that living a 'normal' musicians life wouldn't be possible anymore. In this period a lot changed in my life – and I mean really a lot. Maybe not the way I am deep inside of me but now I know a little more who I am and that all my feelings are not wrong but something worth listening to and caring for. And I already have had many people, also other musicians and piano players, telling me that I am not too bad on the piano. But I think mostly it's not because my playing is so very good. It's because I am what I am and try not to be different. I don't play a role – the music I am playing is what I am. I mostly decide things according to my instinct, my feelings.